One person might not be able to save all of the dogs in trouble, but there are those folks whose generosity reaches beyond what normal people believe is possible and use their creativity to find hope. This sort of hope comes in the form of lending their voices and hearts to dogs that need it the most. I'm talking about those men and women who take on the responsibility of taking in supporting a dog until they can find that forever home. This post is dedicated to those courageous folks, and in particular, Larry pictured here, who was Rusty's foster dad for a year. If you think fostering is something for you, there are a lot of rescue organizations that are looking for this sort of help. 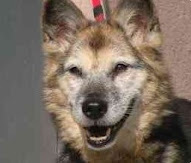 One such organization down here in Southern California is Coastal German Shepherd Rescue, which has a web page set up to explain the options and how to get started. 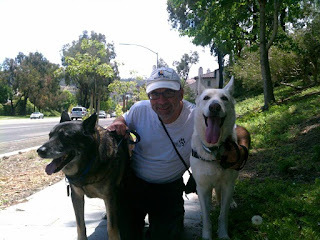 In Northern California, check out San Jose Animal Advocates Foster page for a thorough description of the difference that you'd be making by helping out dogs (or other companion animals) during particularly stressful times in their lives.